It's expected to easily pass the House — and GOP Senate leaders won't be able to block it from reaching the floor for a vote there. WASHINGTON — House Democrats pushed ahead Friday with a measure that seeks to terminate President Donald Trump's emergency declaration that he issued last week in order to circumvent Congress and build his wall along the U.S.-Mexico border. 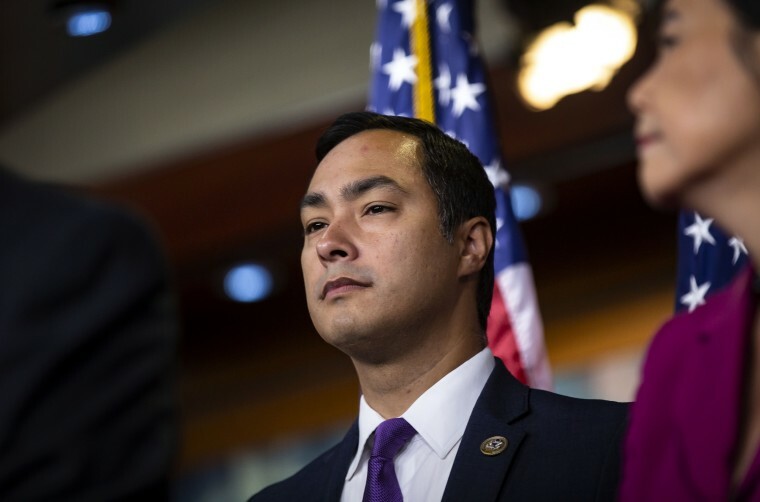 Rep. Joaquin Castro, D-Texas, chairman of the Congressional Hispanic Caucus, introduced a joint resolution in the House that would repeal the president's declaration. The measure was filed during the chamber’s pro forma session, a senior Democratic aide confirmed Friday morning, since lawmakers are on recess and don’t return to Washington until Monday. House Speaker Nancy Pelosi, D-Calif., said the chamber would vote on the resolution Tuesday. The measure has at least 222 co-sponsors, Castro said Thursday evening — representing more than enough votes to pass the House. The resolution is considered “privileged” — which means it would not be subject to a filibuster and require 60 votes to move forward. Instead, it would simply require 51 votes to pass. If all 47 Democrats were to support the measure, they would need only four Republican defections to pass it — in a chamber that has not lacked for GOP criticism of the president's move. Alex Moe and Garrett Haake contributed.